Veteran actor Timothy Tapfumaneyi of the Timmy na Bhonzo fame has been staging a one-man campaign in the capital over the increase of road traffic accidents that are claiming lives. The actor now wants to take the demonstrations countrywide, as he appeals for funding for the campaign. “If I can get support I’m willing to take the campaign countrywide visiting places like Gweru and Mutare with a similar message,” he said. 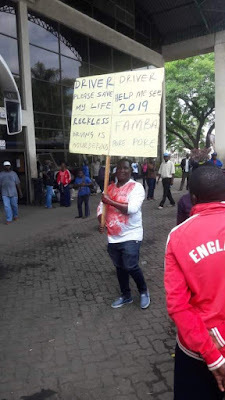 Last week, he visited the Mbare bus termini, Fourth/Simon Muzenda Street and the Mbudzi round about, performing what is referred to as a symbolic act with a placard and his head covered in blood. Timmy as he is fondly known said it is time for action and tangible solutions to curb road carnage which he blamed on human error. Over 70 people have died over the past month in accidents. “Several campaigns have been done to curb accidents with musicians being used but nothing has helped. It is time for something tangible. I believe it matters more to the drivers who travelled on Wednesday seeing me covered in blood. “I believe that image should have clicked in their minds and motivate them to be cautious,” he said. He appealed to bus drivers and motorists to avoid speeding and unnecessary overtaking. “I believe 98 percent of all the accidents are caused by human error that is speeding and overtaking. If the roads are bad then there is no reason to speed. “Look at the Rusape bus disaster; that was pure negligence, the road is fine and that gave people room for speeding. Drivers, not only bus drivers but also motorists should be cautious on the roads, avoid speeding and overtaking,” he said. The popular actor called on the government to be practical in fighting against accidents. He said police presence should increase on highways. “Each time after an accident you will hear the government or the police spokesperson urging the drivers to be cautious on the roads and that’s that. There is need to be practical. “There is highway patrol but they will only be stationed at one point and drivers will only be cautious getting to the place and after that they start speeding. With these recently announced increases in fines I don’t think one will afford to have two or more tickets for speeding,” he said.